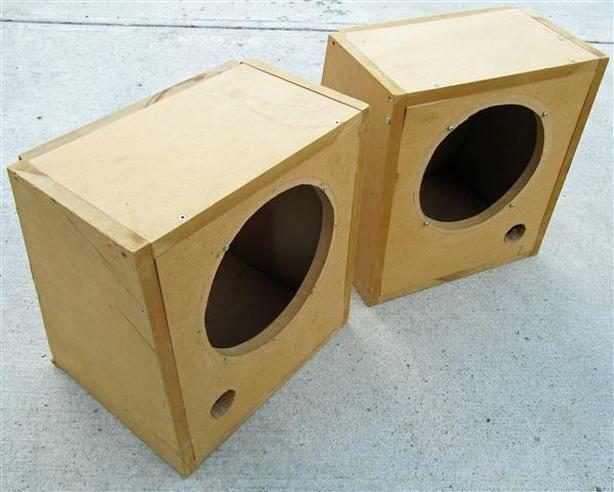 Wedge Shaped subwoofer cabinets for sale. Homemade with 3/8" Medium-density fiberboard (MDF) with a 1" x 2.5d" bass reflex port. Very sturdy construction with excellent damping characteristics. Each unit measures 16"h x 14.5"w x 9"d top & 12"d bottom. Each cabinet has a 9.2" opening to accommodate most 10-inch drivers. Used, but in good condition. $25 each, or $45 for the pair.